Welcome back to our Made in the USA Month! This week, we’re talking about another fantastic all-American company, All-Clad Cookware. Of the many materials used to manufacture cookware, stainless steel is the most popular among consumers, and All-Clad Stainless is among the very best. Made in Canonsburg, Pennsylvania, All-Clad pots and pans are adored by home cooks and professional chefs worldwide. This week’s post packs a double punch! 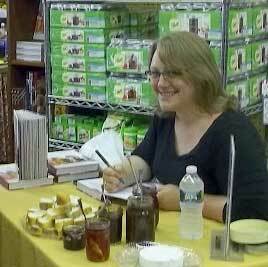 We were honored to have Marisa McClellan of Food in Jars in-store for a book signing on Saturday. Her helpful advice proved invaluable, and the preserves and pickles she brought were absolutely delicious! So we caught up with Marisa afterward, to pick her brain some more. Toque Tips: What tips and tricks would you offer to first-time canners? Marisa McClellan: Make sure to read the recipe several times through so that you understand all its parts. Make life a little easier and get yourself a jar lifter, lid wand and wide-mouth funnel. Keep a space clear next to your jam pot, so that you can slide it off the heat if it threatens to boil over. If a batch of jam doesn’t set up, don’t feel like you’ve failed. Call it ice cream topping or syrup instead. T: This month we’re featuring products that are Made in the USA. Do you have any favorites? Besides mason jars, of course. M: I’m a big fan of All-Clad products (made in Pennsylvania, no less!). They are pricey, but cook so beautifully and last forever. T: How has publishing a book changed your life? T: With your busy book tour schedule, have you been able to squeeze in some time for preserving as well? M: I have been fitting the preserving in whenever I can. Earlier this week, I was in the kitchen until midnight, making apricot jam. I’m not doing as much as I normally do, but it’s not summer for me without at least a few preserving projects. And I absolutely plan on doing a ton of tomatoes at the end of August. I don’t care what else I have to give up, I cannot live through a winter without home-canned tomatoes. T: Your book focuses on water-bath processing high-acid preserves and pickles. What is your opinion/experience on canning low-acid foods such as non-pickled vegetables, stocks, meats, etc., in a pressure canner? M: I love my pressure canner and use it often for things like chicken stock, beans and soups. I really appreciate its ability to create shelf-stable preserves from low-acid foods. It’s a little intimidating to start out with, but once you get used to it, it’s really not hard. T: If you were stranded on a desert island, what’s the one preserve/pickle you wouldn’t be able to live without? M: I think I’d have to bring along some Meyer Lemon Marmalade. It’s zippy, brightly flavored, and would help prevent scurvy! Our thanks to Marisa for her expert advice and good humor! Make sure you check out her fabulous book, Food in Jars. And there’s also our interview with Marisa from last summer for your reading enjoyment. Marisa’s delight in All-Clad is shared by Fante’s staff member Liana, who recently felt compelled to add another All-Clad pan to her kitchen. In echoing what we often hear from our customers, she says, “It’s excellent quality, beautiful cookware that is hand-crafted in the USA, and I fully expect it to last past my lifetime”. All-Clad Metalcrafters LLC was established in 1971 by John Ulam, a metallurgist. Ulam realized that combining metals such as stainless steel and aluminum provided superior heating results. After perfecting the metal bonding process, he began producing professional-quality cookware. Still made in Canonsburg, Pennsylvania, All-Clad Cookware is a testament to American craftsmanship and innovation. 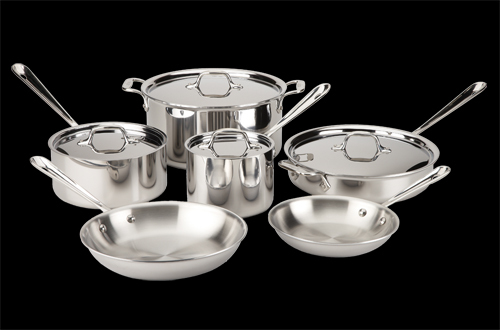 The Stainless Collection, introduced in 1990, is a favorite among All-Clad “collectors”. Its tri-ply construction features one layer of magnetic stainless steel, making it usable on induction stoves, a middle layer of pure aluminum, for great conductivity and even heating, and a layer of 18/10 stainless steel, for resistance against stains and reactions with acidic foods. This last layer also features their patented “starburst finish”, which radiates tiny ridges from the center of the pan out towards the edges. Besides being very pretty, it also increases the durability of the pan and helps to prevent sticking. All-Clad cookware is favored by many professional chefs for its performance, durability, and easy cleaning. It’s even dishwasher safe! “Unlike in an encapsulated bottom cookware line, where a disc of aluminum is sandwiched in between two layers of stainless steel at the bottom of the pans, All-Clad’s cookware has an aluminum core all through the whole pan. This helps the pan heat faster, and hold its heat better. That makes cooking food in an All-Clad pan much easier – and quicker, too. “Because of the fully clad aluminum core, the pan cooks more evenly, making browning and searing a breeze! Also, the pan rebounds faster from the thermal shock of putting cold oil into a hot pan, and therefore the food absorbs less oil. All-Clad pans are great for preparing sauces such as a red wine reduction. Because of the pan’s even heating, liquids will reduce at about half the rate a typical encapsulated bottom pan would. Come to the store to see for yourself why people love All-Clad so much. This Saturday from 11 to 3, friend of the store Sue will be here cookin’ up a storm with All-Clad. She’ll be sharing her fantastic skillet potatoes – both as samples and a printed recipe! As an extra special add-on, we’re offering not one but two FREE giveaways this weekend! First up, we’ll be holding a drawing for a Made-in-USA Vic Firth Columbia Upside Down Pepper Mill. We’ll also be giving away a beautiful All-Clad 11″ Open Casserole. Don’t miss your chance to win; all you have to do is come to the store and fill out an entry blank! Made in the USA Month continues next week with our look at another American cookware company, Lodge Manufacturing Company, of South Pittsburg, Tennessee. Stay tuned!